The Catholic diocese of Mississippi had its own newspaper, The Mississippi Register, edited by Father Bernard F. Law. 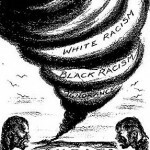 These cartoons represent a stark contrast to the racist views expressed in the mainstream Mississippi media such as the Jackson Clarion-Ledger. Most white Mississippians who supported equal rights were afraid of expressing that view in public for fear of repercussion from their peers. The combination of ignorance and hatred in Mississippi was expected to lead to violence, which, like a tornado, would devastate the land. 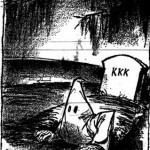 The Ku Klux Klan crept up from the graveyard of history into Mississippi society. 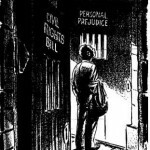 The Civil Rights Bill of 1964 was an important first step to change in American society, but an end to personal prejudice would release African Americans from the prison of racism.